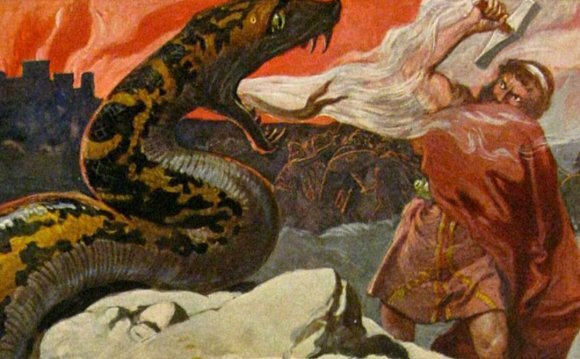 Odin (or, depending upon the dialect Woden or Wotan) was the Father of all the Gods and men. Odhinn is pictured either wearing a winged helm or a floppy hat, and a blue-grey cloak. He can travel to any realm within the 9 Nordic worlds. His two ravens, Huginn and Munin (Thought and Memory) fly over the world daily and return to tell him everything that has happened in Midgard. He is a God of magick, wisdom, wit, and learning. He too is a psychopomp; a chooser of those slain in battle. In later times, he was associated with war and bloodshed from the Viking perspective, although in earlier times, no such association was present. If anything, the wars fought by Odhinn exist strictly upon the Mental plane of awareness; appropriate for that of such a mentally polarized God. He is both the shaper of Wyrd and the bender of Orlog; again, a task only possible through the power of Mental thought and impress. It is he who sacrifices an eye at the well of Mimir to gain inner wisdom, and later hangs himself upon the World Tree Yggdrasil to gain the knowledge and power of the Runes. All of his actions are related to knowledge, wisdom, and the dissemination of ideas and concepts to help Mankind. Because there is duality in all logic and wisdom, he is seen as being duplicitous; this is illusory and it is through his actions that the best outcomes are conceived and derived. Just as a point of curiosity: in no other pantheon is the head Deity also the God of Thought and Logic. It's interesting to note that the Norse/Teutonic peoples also set such a great importance upon brainwork and logic. The day Wednesday (Wodensdaeg) is named for him. Thor, or Donnar, also known as the Thunderer, was considered to be a son of Odin by some, but among many tribes Thor actually supplanted Odin as the favorite god. He is considered to be the protector of all Midgard, and he wields the mighty hammer Mjollnir. Thor is strength personified. His battle chariot is drawn by two goats, and his hammer Mjollnir causes the lightning that flashes across the sky. Of all the deities, Thor is the most "barbarian" of the lot; rugged, powerful, and lives by his own rules, although he is faithful to the rest of the Aesir. The day Thursday (Thorsdaeg) is sacred to him. Freya is considered to be the goddess of Love and Beauty, but is also a warrior goddess and one of great wisdom and magick. She and her twin brother Freyr are of a different "race" of gods known as the Vanir. Many of the tribes venerated her higher than the Aesir, calling her "the Frowe" or "The Lady." She is known as Queen of the Valkyries, choosers of those slain in battle to bear them to Valhalla (the Norse heaven). She, therefore, is a psychopomp like Odhinn and it is said that she gets the "first pick" of the battle slain. She wears the sacred necklace Brisingamen, which she paid for by spending the night with the dwarves who wrought it from the bowels of the earth. The cat is her sacred symbol. There seems to be some confusion between herself and Fricka, Odin's wife, as they share similar functions; but Fricka seems to be strictly of the Aesir, while Freya is of the Vanic race. The day Friday (Frejyasdaeg) was named for her (some claim it was for Fricka).